Downtown Elkin is rich in history and charm. The town of Elkin was named after the Elkin River, now known as the Elkin Creek, first indentified on the 1770 North Carolina map drawn by John Colet. Settlers began moving to the area around 1752. One early resident, David Allen operated an iron works along the Elkin Creek as early as 1776. This is the first documented industry in the area, and was frequented by the Moravians from Salem in Forsyth County. Richard Gwyn, referred to as Elkin’s founding father, moved to the north side of the Yadkin River from Jonesville in 1840. He built a gristmill along the Elkin Creek where the Elkin Public Library is now located. In 1847 he built an addition to the mill to house a small cotton mill and established the Elkin Manufacturing Company. Around 1950 he built a small one-room schoolhouse to serve as the community church and school. This structure survives today and is the oldest school and church in Surry County. In the last few months of the Civil War, Major General George Stoneman and his raiders passed through Elkin in April 1865 during his destructive raid through Western North Carolina and Virginia. 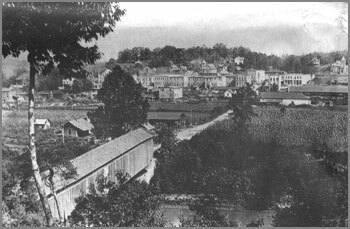 In May 1872, the towns of Elkin and Jonesville were connected for the first time by a bridge. A covered bridge with a span of 210 feet was built by a Mr. Lindsey from New England and was said to be the longest wooden suspension bridge in the world at that time. It initially operated as a toll bridge but was later purchased by Surry and Yadkin counties and operated freely. It was replaced in 1913 with a steel structure. In 1877, the Elkin Valley Woolen Mill was established by Alexander Chatham and Thomas L. Gwyn about one mile further up the creek from the cotton mill. The original dam that provided water power for this mill can be viewed from the Elkin Valley Trail leading north from the Elkin Municipal park. In 1890, Mr. Chatham became the sole owner of the woolen mill and the name was changed to Chatham Manufacturing Company. In 1893, Chatham moved the mill from this site to a location east of town alongside the new railroad that came to Elkin in 1890. Chatham Manufacturing eventually would become one of the largest blanket manufacturers in the world, producing millions of blankets for our armed forces during both WWI and WWII. 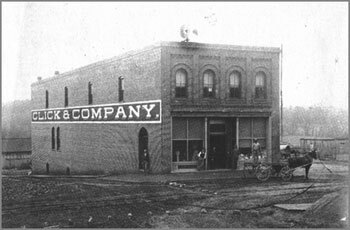 Officially charted in 1889, Elkin continued to grow alongside it’s major industries of textiles, furniture, shoes, veneer, and locust pins and brackets. The first major newspaper published was the Elkin Times, begun in 1892 by R.L. Hubbard and John Roth. It eventually gave way to its competitor, The Elkin Tribune, which was started in 1911 by W.E. and H.G. Nichols and is still in business today. On July 4, 1911, Elkin celebrated the official opening of the Elkin and Alleghany Railway, a now abandoned railway whose goal was to reach Sparta and beyond. It never made it beyond the foot of the mountain below the community of Roaring Gap. However, today the first two miles of the railroad bed have been made into a wonderful multi-use trail by the Elkin Valley Trails Association. 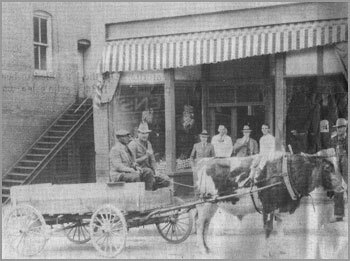 Enjoy Downtown Elkin’s rich history and character as you shop and dine downtown.